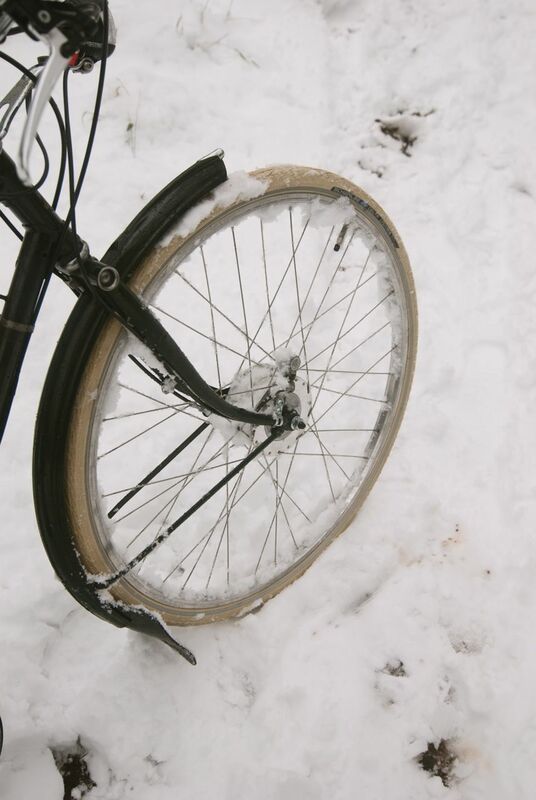 Continuing on from my last post about my Raleigh Superbe drum brake conversion, I've now clocked up about 500km on my Sturmey Archer drum brake hubs, I've managed to cycle through some icy roads, get a bit soaked in rainy weather and pedal down some bumpy muddy towpaths. After a few initial niggles I've had no real major problems, well apart from the freewheel rattle that I had before, it's come back. I suspect through spinning the hub, the grease gets flicked outwards by centrifugal force inside the hub, also I suspect the sub-zero temperatures here in the mornings doesn't help either. I'll start of with a few things, I suspect that the Tektro FL-750 levers I have are a bit on the small side for drum brakes like these. The official Sturmey Archer levers are basically big 4-finger levers, much like the type you used to get on MTB's from the 80's and 90's which were meant for traditional cantilever brakes. 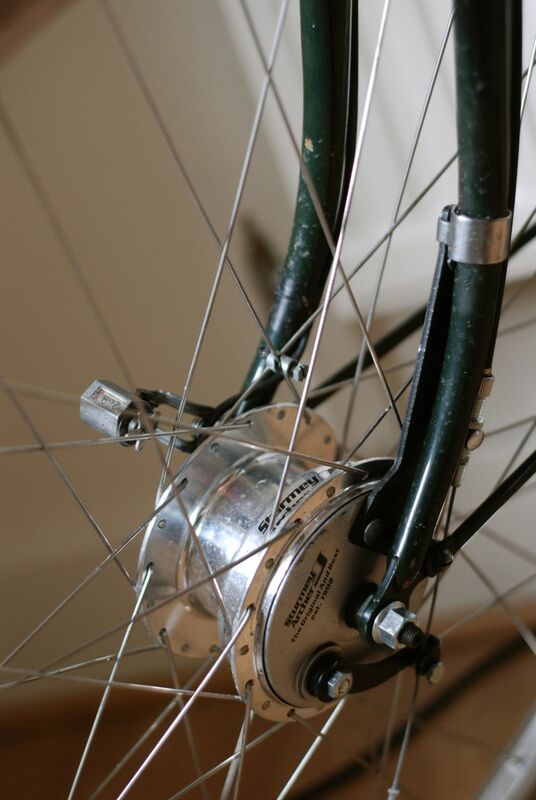 I've used the 70mm Sturmey drum brake with that style of big 4 finger lever on a Gazelle town bike and the brakes felt stronger and more powerful. The Tektro levers are more like a 3-finger lever, so I suspect this is why I can still pull the lever all the way to the bar and not get a complete wheel lockup with the cable adjusted. My first impression of the drums was that they were a bit underwhelming, after riding them for a while I've found that is definitely not the case, a hard stop from 30km/h+ happens very rapidly and in a very smooth controlled manner. They have definitely saved my bacon several times, many instances of cabs stopping suddenly or unseen potholes in the road. I now know the reason why I was a bit underwhelmed by them, mostly because the self-energising action which has a strange feel compared to discs or rim brakes. 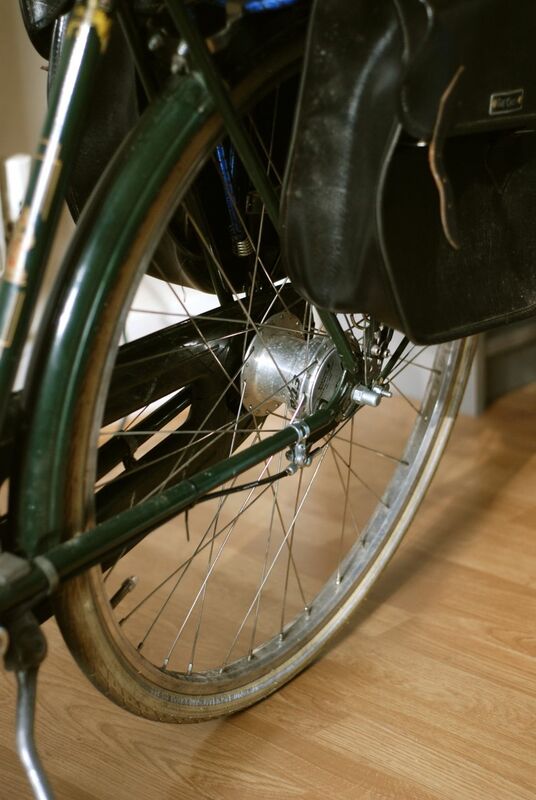 At a walking pace, a hard pull on the levers won't flip you over the bars instantly like with V-brakes, but at higher speeds when you pull on the levers you feel a slight braking effort then a ramping up in power then you stop. It's the leading shoe starting to catch and then apply itself to the drum which gives you that strange feel. I'm still constantly surprised at how quickly a hard squeeze on both levers will bring the bike to a stop, the self-energising action just feels a bit strange. I'm very happy with the power as it is, I'm thinking of upgrading the levers to the larger 4-finger Sturmey units maybe later to get even more power. The modulation as I said in my previous post is excellent, the feel is pretty close to disc brakes, you can very easily adjust the amount of braking with more or less lever pressure. I haven't noticed a huge difference in power due to breaking in to be honest, as the rear drum was used, it was probably already broken in, the front was brand new and it had reasonable power to begin with which hasn't really changed much. The front definitely does most of the braking, just the rear by itself is still a bit underwhelming, by itself it will bring the bike to a stop eventually; I'd say it's about equivalent in power to a good single pivot rear. The 70mm rear drum I used on my friend's Gazelle with the big 4-finger levers felt a bit stronger however, so I suspect my impressions are limited by my choice of the smaller Tektro levers. Even in inclement weather, including some decent rain and some ice the brakes have remained faultless, the best thing about hub based brakes is the consistency, you just heave on the levers in any weather and it will stop exactly the same way. I'm quite used to the rim brake technique of skimming the brakes in the wet occasionally to clear the rims of water, so when I do need to actually brake it will start biting sooner rather than later. Although in reality, this technique isn't that great in traffic and there is still a delay from when the lever is squeezed to when the brakes start to bite. The drums just work instantly which means you can really depend on them to get you out of trouble. The front XL-FDD hub incorporates a 3.0watt dynamo as well as a 90mm drum brake, this is hooked up to a Busch + Muller Lyt headlamp and a Toplight D rear lamp. 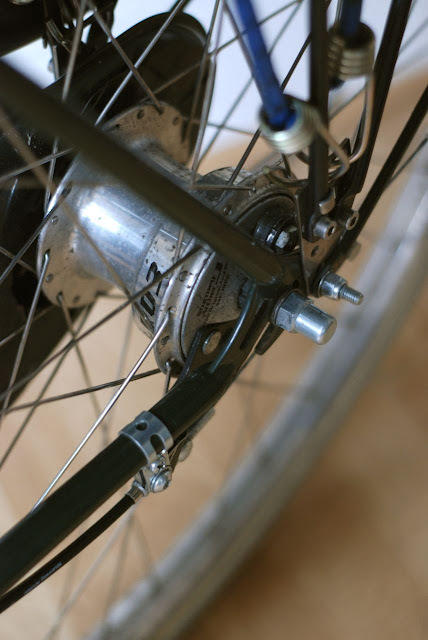 From some tests that I have seen, the Sturmey Archer dynamo isn't as low drag as the SON or high-end Shimano units, however from my own riding I can't really tell any difference whether it's turned on or off. I guess that for the type of riding I'll be doing on the Superbe that drag isn't really an issue with any quality dynamo hub. The headlight is noticeably brighter than when it was powered by the lower wattage vintage Sturmey Archer AG dynohub that came with it originally. I've had no problems with the dynamo otherwise, it just works perfectly fine, not much to report. The X-RD3 hub features a 3 speed epicyclic hub more or less identical to the current crop of Sturmey Archer 3 speed hubs, it has the NIG (no inbetween gear) feature which means there is no neutral position between normal and high gear like the old hubs. Also when I tore it down initially I noticed that compared to the older design of the AW hubs, the machining and casting of the parts was generally finer and a lot more precise. Initially I did find a broken main pawl which I replaced, since then there have been no problems. I have had the occasional slight crunch sound sometimes when changing gears and pedalling but so far this hasn't had any negative effects. The rattle I discussed earlier is really starting to bug me, the noise is bordering on unbearable, coasting along in high gear emits this great rattling sound. This would never have been a problem with the oil lubricated hubs of old, as well I appreciate the fact that an occasional top up of the oil in the hub will leak out a bit of oil bringing out any contaminants as well, which avoids a teardown for a very long time. The current grease lubricated hubs will require a teardown every few years and a replenishment of the grease, I also don't like the thought of all the gears grinding around in dirty grease later in its life. I'll have to make a decision what to do when I pop the hub open next time. Other than the rattle which is only a minor problem the hub has been excellent, shifting is more or less the same as the old design. The Sturmey Archer XL-FDD and X-RD3 combination makes for great update to an old design, they did in the past make the BF front drum hub as well as the AB 3 speed drum hub in the past, however this modern setup incorporates a 3.0w dynamo in the front as well as the improved NIG internals. The drums offer consistent, reliable and strong braking in all conditions. Maintenance is more or less non-existent other than cable adjustment until the shoes wear out, which will take a very long time. My only note is that with larger brake levers with more leverage and cable pull, I should be able to get even more performance out of the brakes. The dynamo so far has worked without any fault, I can't give any real opinions about drag other than I didn't notice anything excessive. The gearing in the rear hub is also excellent, very dependable and simple like the old AW design but without the faults. The grease lubrication is something that I am a little wary about, I much favour the oil lubrication of the old hubs, as well as the fact that I may have to tear down the hub in a year or so to replenish the grease instead of dropping in some oil every now and then. Overall though, the conversion has gone really well even with the problems that I did experience. The drums allow me to ride in inclement weather and on wet roads without any fear of non-functioning rod brakes. At the beginning of Sturmey Archer's history, they were a very innovative and high quality company. They largely pioneered the Dynohub and the geared hub; their products were well made and innovative. However, it started its slow progressive decline as a company from about the 70's and reached its low point in the early 2000's when it went bankrupt and was sold to Taiwanese Sunrace. Much like the stories of many British manufacturers. However Sunrace has really resurrected the Sturmey Archer name, even though they are no longer made in England, the spirit of the old Sturmey Archer is back for good. The new hubs are fantastic, and they have the widest array of models, shifter options, mounting options as well as a vast back catalogue. No other hub gear on the market comes close in this respect. I've done about 1200km on the hubs now and I've noticed that the braking strength has gotten that extra little bit stronger over the past few hundred k's. The rear just locks up if I don't have much weight on the back of the bike and the front will bring it to a stop a little bit quicker than before. I have done no maintenance to the brakes whatsoever this whole time. The mileage now is about 2700km, I've ridden these hubs through a lot of rain, as the summer here has been extremely wet. The braking has performed flawlessly and is still powerful and consistent. I think I know what the slight crunch sound when taking off from a stop is, I suspect the position of the pawls inside the hub in a certain position isn't perfectly aligned with the ratchet in the inside of the hub shell which means it doesn't fully engage, and then slips until the next position when it grips. It's only really minor so not really a big issue. The only maintenance I have done this whole time to the hubs is add a few drops of oil in the back and turning the cable adjuster to take up a little bit of slack. I think I've had the same rattling as you with the XRD3. Eventually I had to take the hub apart for another reason and when I reassembled it, the rattle had stopped. It seemed to be caused by the piece which engages with the planet cage in third gear, which was altered in shape slightly in the NIG versions of the hub, when coasting it would push the indicator Rod in and out rapidly causing a rattle. When I tweaked the hub I didn't do anything to this piece directly, I believe that it might have been down to the bearing come adjustment being slightly wrong originally. Since then the hub has been fine for me. Hope this vague comment helps you sort it out. Hey there, I wrote about the problem in a previous post here http://smutpedaller.blogspot.com/2012/01/new-year-and-new-problem.html and the rattling is caused by the planet pinion pins spinning when the clutch is engaged with them in high gear, the ramps on the face of the clutch cause it to bounce up and down. When freewheeling, the clutch and driver are stationary whilst the ball ring is fixed to the hub which is rotating with the wheel. Normally the gear ring which has the main pawls should stay stationary and you should hear the main pawls, however because the clearance between the gear ring and the ball ring is very close, if there is too much grease it will get pulled along with the rotating hub and thus spin the planet cage, which spins the pinion pins under the stationary clutch causing the rattling. I popped open my hub last weekend and removed most of the grease from the hub and only left a thinnish layer on the internals, this has finally fixed the rattle issue and now it just freewheels beautifully. I have a problem with my X-RD3 drum brake. It won't lock the wheel. This is a little bit annoying because I don't feel safe (locking the wheel is too important in critical situations), but also I love whellieing particularly at high speeds. Not-locking rear brake is just taking a big chunk of fun away my daily rides. I have thought about putting back V-brakes, but given that I cannot get rid of the X-DR3 drum brake I thought I might try to fix it. It is hard to say what the problem is, when I bought the hub second hand I disassembled it completely, after it was fine – beside the brake issue – and I have been using it for 12 months now. I just cannot do without wheelieing any more. 1) Could the problem be that I have not assembled the brake properly? Has anyone ever had issues with assembling drum brakes and losing out on performance? 2) I use London Boris's bikes sometimes, which fit drum brakes, and I have found locking rear wheels on about 15% of cases. Quite poor, but how comes that those 15% lock? What’s the trick? 3) Do you think that I might need to change the brake unit? Is it worth it to buy a new one -£39- if then I am going get the same issue? (I can get a V brake with good pads for £15). Any suggestion, shared issue, etc is appreciated! Thank you! 1) As long as you've referred to the exploded diagrams it should be correct, I imagine it'd be difficult to assemble the drum part of it incorrectly unless you have actually disassembled the backing plate itself, although that is reasonably simple. 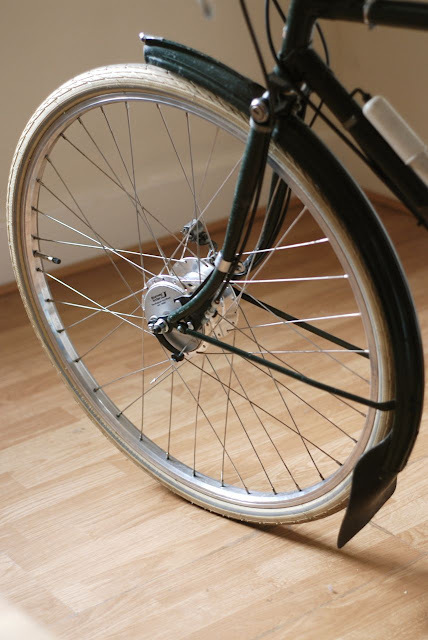 2) The boris bikes use the Nexus band brake which is also used on a lot of utility bikes. I've found them generally to be woeful and inconsistent from bike to bike. 3) I would just leave it, but if you really want more power either go for the V's or upgrade to the XL-RD3 which has the larger 90mm drum. I'm going for the V brake! Thanks for your opinion! Thanks for the exhaustive review - I've been riding with an XFD and an X-RD3 now for almost two years. They are very reliable and I was even thinking of upgrading to a 10mm drum on the front wheel. But reading that it bent your fork makes me wanna keep the smaller 70mm one. As for the crunching sound while pedalling forward: I had this noise as well. Turned out to be the thread of my left pedal that was emitting the noise. Greased it and now the crunching is gone.